This Article revisits two fundamental issues in corporate law. One — the central role of the business judgment rule in fiduciary litigation — involves a great deal of seemingly settled law, while the other — is there a mandated corporate purpose — has very little law. Using the emergent question of whether the business judgment rule should be used in analyzing officer and controlling shareholder fiduciary duties, the latter issue having recently been addressed by Chancellor Strine in the widely-heralded MFW decision, this Article proposes a fundamental rethinking of the rule’s analytical preeminence. For a variety of reasons, it is suggested that fiduciary duties should be made more prominent and the business judgment rule should be dramatically deemphasized. The policy rationales for the rule are sound, but they have no relevance for shareholders and introduce needless complexity. For directors, those rationales do not apply in the loyalty setting, and in the care setting, can be achieved by recalling simply that there is no substance to judicial review in that context. As to corporate purpose, the Article advocates that Delaware law permit a pluralistic approach in the for-profit corporate sector. Long agnostic about ultimate corporate objective, Delaware law may have turned unnecessarily toward a strict shareholder primacy focus in the 2010 eBay decision. To bring clarification and to foster flexibility, Professor Johnson recommends a legislative default provision, with an opt-out feature. This feature should be in the business corporation statute itself. Delaware’s new benefit corporation law laudably advances the goal of institutional pluralism, but does so at the ironic risk of reinforcing a belief that business corporations themselves are legally permitted only to maximize profits. Judges in a democratic society should not dictate institutional goals. Lyman P.Q. 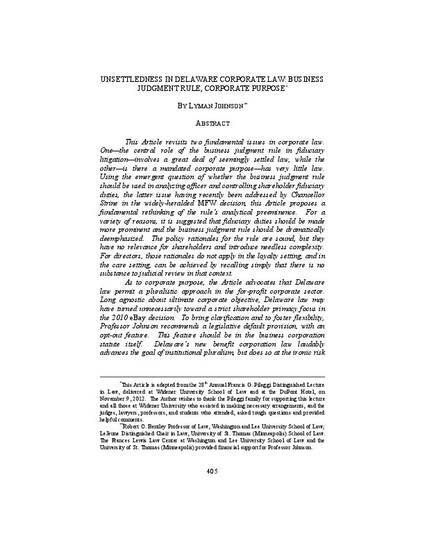 Johnson, Unsettledness in Delaware Corporate Law: Business Judgment Rule, Corporate Purpose, 38 Del. J. Corp. L. 405 (2013).